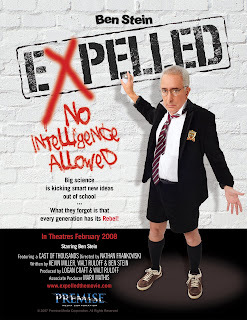 It hasn't even been released yet, and already Ben Stein's "Intelligent Design" (i.e. Creationism in disguise) documentary Expelled is drawing controversy. Recently, noted scientests P.Z. Meyers and Richard Dawkins (author of The God Delusion) attended a screening of the film, where Meyers, upon being recognized was barred from entering. Dawkins and Meyers' family were still allowed in (one assumes they did not recognize Dawkins...despite filmmakers claims to the contrary). The film, according to the New York Times, "asserts that people in academia who see evidence of supernatural intelligence in biological processes — an idea called “intelligent design” — have unfairly lost their jobs, been denied tenure or suffered other penalties as part of a scientific conspiracy to keep God out of the nation’s laboratories and classrooms." I have yet to see the film, so I will refrain from making comments on the film itself until I have seen it, but the central premise, that Intelligent Design should be taught in schools, is a flawed one at best. It seems these creationists have problems with such things as facts, which as Stephen Colbert would say, have a notorious liberal bias. A scientific theory is merely a fact that cannot be tested in a laboratory...Intelligent Design, no matter how you dress it up, is a belief system, and has NO business being taught in science classes alongside evolution as an "alternate viewpoint." Leave it for Sunday school where it belongs. One has to wonder what the Creationists are afraid of, and why they barred Meyers from attending. These are the types of things conservative blowhards love to complain about when it comes to the other side, and as such this action is the very height of hypocrisy. Sasha Stone over at Awards Daily posted an item about this yesterday, only to be immediately shot down for being anti-Christian. That is ridiculous of course. Being against Intelligent Design taught in classrooms is not anti-Christian - it's anti-stupidity. Not to say that those who believe that God set things in motion are stupid...but anyone who totally denies the existence of evolution is a fool. Plain and simple. Believe that evolution is God's tool if you must...but to deny evolution is to totally ignore the facts. Nice review. You're absolutely right about the relgious angle.